Currently, I work for the global design and technology consulting firm Sapient Corporation. At Sapient, I’m a member of the Research + Analytics team, and specialize in gathering/synthesizing consumer and industry research, mostly of secondary nature. I generally work with internal teams to help them ‘get smart, quick’ about various industries, as well as assist with the development or support of marketing strategies. In the evenings and weekends, I’m an aspiring professional foosball player. How did you discover Behance’s Action Book? I can’t remember exactly...I think I read about it on a blog like PSFK. I’ve always had a secret love for interesting notebooks and was a big fan of the Moleskine notepads throughout college. I secretly wanted to buy the Action Book during college but I could buy Moleskine at the bookstore, which was more convenient. Plus, I was using the Moleskine mostly as a repository for random thoughts and ideas, and the Action Book seemed more productivity-oriented, so I waited. Last summer, I was freelancing with Fallon in Minneapolis, and my co-worker had the notebook as well, so maybe that was what reminded me of it when I came to Chicago. I’ve only been using it for about a month, but it has been the greatest month of notebook usage of my entire life. How do you use it and what information do you put into it? I mostly like it for the built in to-do list on the right side of the notebook, which seems kind of silly to say, since any notebook can do that without having to spend $20. But the list is nice because I can see at a quick glance all the projects I’m working on. And if I need to, I can flip backwards through the book to see what projects I worked on in previous weeks. There is something to be said aesthetically about not having to draw one’s own little compartments to create a to-do list. So far, I haven’t had to use more than two pages a week, so that has kept a nicely organized record of all my projects. I also take notes that I think will be useful for that week’s work, or for projects in the future. For instance, we had a rep from one of our database services come in to give us a walk-through, and I kept notes from that in the Action Book because I thought they would come in handy later for other projects. If I’m dedicated to one or two big projects for a week, I keep a list of important contacts in the notebook as a reference so I don’t have to keep sifting through emails. If I’m just taking notes or brainstorming, I’ll use a different plain notebook. whether to enter information or refer to it? I add info into the Action Book pretty much every day. Whether it’s adding a project name and description, a job number (oh, that’s right, I also keep job numbers in my Action Book so I don’t have to sift through emails), notes about something important, or how I’ve allocated my time on each project. I use it more as a record-keeper of everything that I’ve done. I refer to it all the time to keep myself focused and aware of everything on my plate. 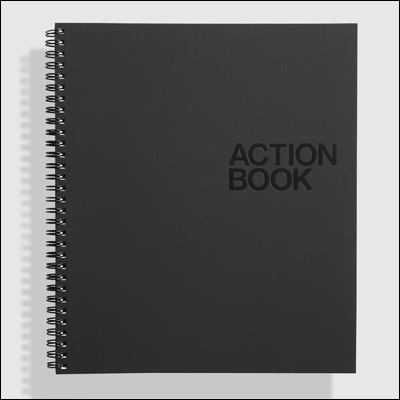 What did you use before the Action Book? I was pretty much just using plain notebooks. The problem with that was that I would still make lists, but I would often just haphazardly scribble notes, to-do’s, reminders, etc., all over the page. Since there was no pre-designated segmentation, all of my information just got lost in a hodge-podge of scribbles. Now the Action Book definitely has a separate role from the plain notebook, which I still use to scribble random thoughts. Most of the important logistical stuff though, goes into the Action Book, which definitely helps keep me organized. I like it quite a bit. I don’t think I use all the features of the Action Book for their designed intentions, but I’ve found that it has kept me organized and, hopefully, more productive. I think it is especially useful for people who are involved in many projects at once, or involved in a project with many defined steps. My one major critique is the cover... I think the cover could be stronger. I thought when I purchased that the cover was leather, like the Moleskine series, but it is a stronger cardboard which, needless to say, is still subject to the pitfalls of water. All images courtesy of Seijen Takamura.